Spartan fans cheer on the men's basketball team during the semifinals of the SoCon Tournament. UNCG defeated Wofford 77-73 on Sunday night. That’s the best way to describe the atmosphere on campus today as the UNCG men’s basketball team prepares to take on East Tennessee State in the Southern Conference Championship game tonight at 7 p.m. The Spartan faithful have been abuzz all weekend. Busloads of students and alumni traveled to Asheville on Saturday and Sunday and turned the U.S. Cellular Center into a sea of blue and gold. Nearly 300 students will make the trip today. It’s already been a historic year for Spartan hoops fans – the team’s 25-8 record is the best in program history, and the current nine-game win streak is the longest for the Spartans at the NCAA Division I level. But ask Head Coach Wes Miller about all of the success, and he’ll tell you that the team is not done yet. They’re focused on vying for the tournament title and an NCAA Tournament berth – and they’re relying on the support of students, alumni and fans across the country. 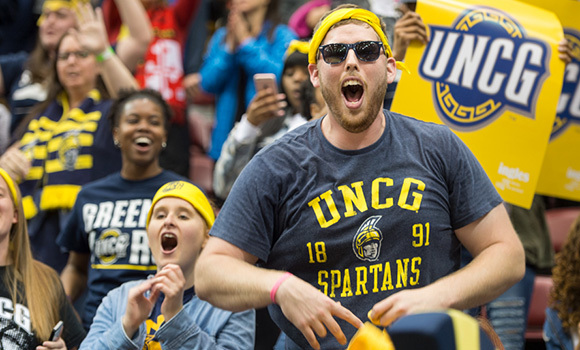 UNCG is hosting a student watch party starting at 6:30 p.m. in the Cone Ballroom of the Elliott University Center. In Greensboro, alumni and friends will gather at 6 p.m. at the nearby Old Town Draught House on Spring Garden Street. Raleigh alumni will meet at Carolina Ale House on Glenwood Avenue, and Charlotte alumni will meet at Rock Bottom Restaurant & Brewery on N. Tryon Street. If you’re not able to attend a viewing party, make sure to tune in to ESPN at 7 p.m. and follow UNCG Athletics – and the hashtag #letsgoG – on Facebook and Twitter.